13 ½” X 19” serigraph print--contemporary design. 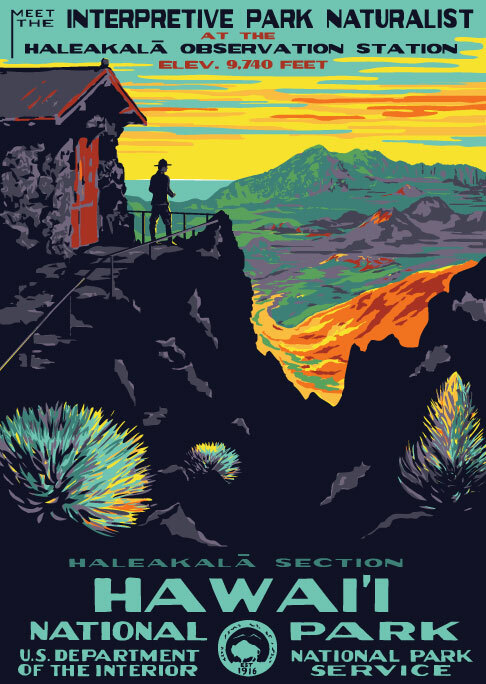 Since the release of the Volcanoes poster, Haleakala has asked for a design to complement it. Here we present a full 10 color, and our most complex design of the CCC built Haleakala Observatory Station complete with a 1930s ranger and sunrise vistas across the crater to the sea. Silver Swords highlight the foreground. Haleakala wanted the diacritical marks (introduced to the written Hawaiian in 1970) in the Hawaiian placenames. Due out in January 2015.